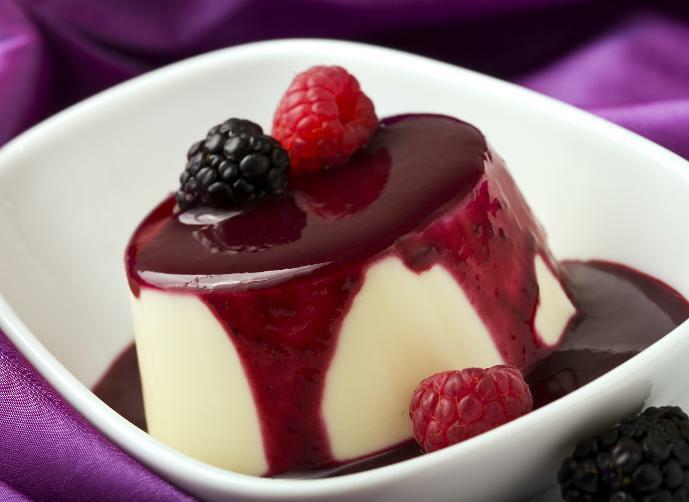 The Panna Cotta sweet is an Italian sweet light and testy , it could be in many flavor like strawberry , vanilla , blackberry , or so. mix the milk with cream, sugar and vanilla in a bowl, till the sugar is solved then put the mixture on fire . At the same time solve the gelatins with three cups of warm water. Take the mixture of fire , add the gelatins mixture and put it back on the fire for two minutes . Put the mixture into Templates and move it to the fridge for three hours . Empty the template carefully , add strawberry syrup or any flavor you want then add slice of fruits for good showing.